Grandville located in Southwest Kent County on the Grand River had a population of 16,758 reported by the census of 2009. It is one of the first suburbs of Grand Rapids. A community founded on religious beliefs one might expect to live next door to Ozzie and Harriet. It was not until the 1970’s that businesses were allowed to open on Sundays. Today it is an energetic and successful community with the largest mall, RiverTown Crossings Mall, in the area. 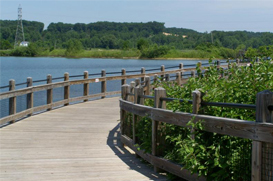 Johnson Park on the Grand River is a destination site for outdoor enthusiast of all types. The steep, winding one lane road that runs up and around the peak of the park draws many grand prix want-a-be. It is easily the most exciting tobogganing hill in the area. It is a beautifully maintained park with hiking trails for the novice to those who prefer a challenge. The Grandville school district classrooms have one teacher for every 20 students. The dropout rate is 4% as reported in 2008.